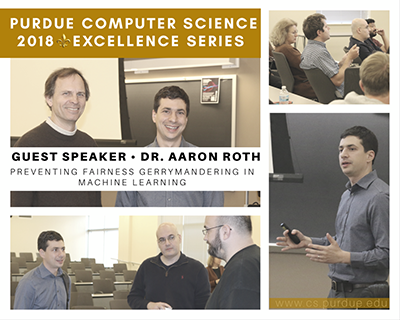 The Purdue Department of Computer Science concluded the 2018 Excellence Lecture Series with a colloquium by Dr. Aaron Roth titled: Preventing Fairness Gerrymandering in Machine Learning. Machine learning can create potentially life-altering challenges for individuals. From the data which banks use to grant loans, to whether or not bail is granted in a court system – more decisions affecting our lives are made using big data. Machine learning makes it possible to analyze the staggering amount of data collected and is increasingly integrated into industries and every facet of our lives. While improving our connectivity and the way we live, it’s possible for machines to unfairly favor one group of individuals over another. Simple approaches to fairness can just move the problem from overall groups to unfairness in subgroups. Dr. Roth’s colloquium showed how to prevent this fairness-gerrymandering. His talk is based on two papers that are joint work with Michael Kearns, Seth Neel, and Steven Wu. Dr. Roth is the Class of 1940 Bicentennial term associate professor of Computer and Information Sciences at the University of Pennsylvania, affiliated with the Warren Center for Network and Data Science, and co-director of the Networked and Social Systems Engineering (NETS) program. His research focuses on the algorithmic foundations of data privacy, algorithmic fairness, game theory and mechanism design, learning theory, and the intersections of these topics. Together with Cynthia Dwork, he is the author of the book “The Algorithmic Foundations of Differential Privacy.” Together with Michael Kearns, he is the author of “The Ethical Algorithm”, forthcoming in 2019 by Oxford University Press. Click here to view Dr. Roth’s information.